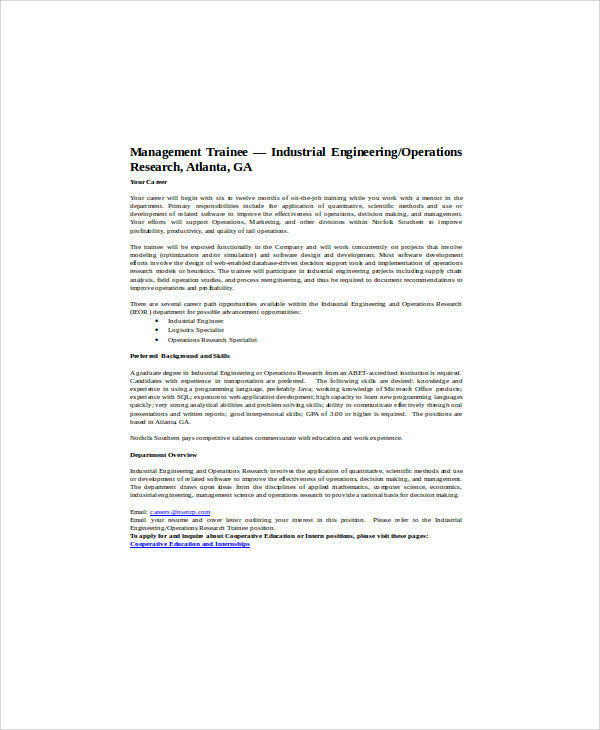 Want to land a job as an industrial engineer? 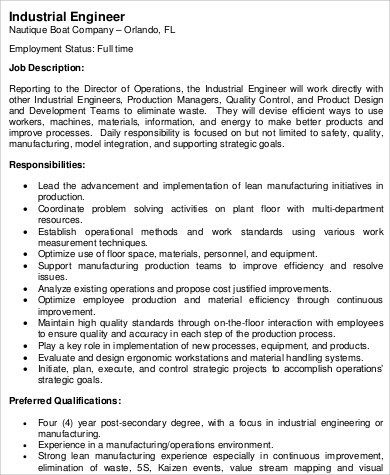 If you happen to be a hardworking fellow who is an aspiring engineer and who wants to land a job as an industrial engineer, wait no more. Though it is not at all fun and games, having a job as an industrial engineer may be at times demanding and sometimes stressful but it is all worth it, especially if you love what you do and you have that eagerness and willingness to learn, you are definitely on the right track. 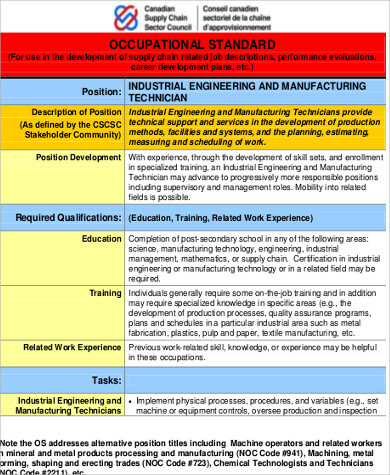 Do consider having a look at these Job Description Samples that you might find useful. 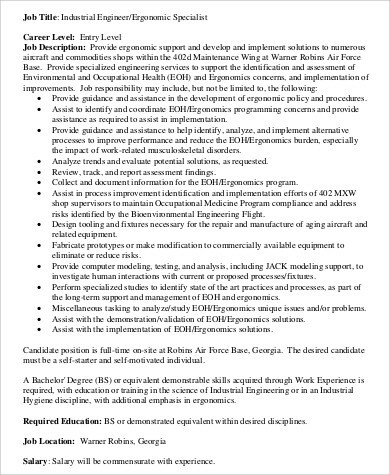 You can also have a look at these Biomedical Engineering Job Description Samples that can be helpful and handy if you are curious about a similar related topic with regards to the subject matter. 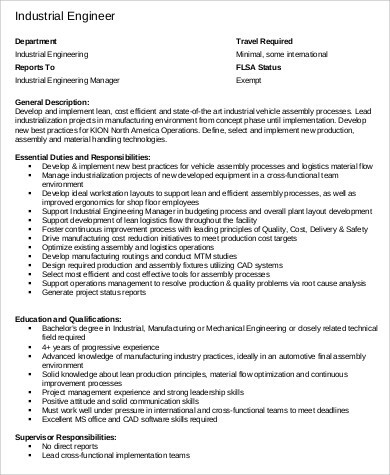 Also, it can be absolutely helpful to gather round some information and lot more details inclining toward the job description for an industrial engineer. It is very essential to know more and to have a lot of ideas and a widened perspective toward what to expect and what to do in the future when it comes to your potential workplace. 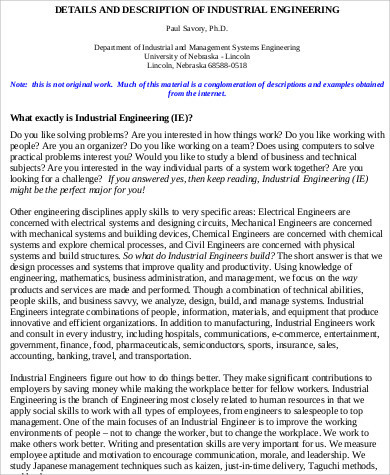 It can also help you ask and assess yourself deep within if you definitely want to be spend several years of your life working as an industrial engineer or not. Collecting Data – this is one of the key responsibilities of an industrial engineer in which you have to gather some data from various sources. These could be the following but is not limited to plant facility, production lines, company information, and work information. For plant facility, these are the data on the number of employees as well as the company’s number of departments, the plant space, and the plant size. For production lines, these would be the timings of shifts, the number of the goods or the output made, and the understanding of the work process and its system. 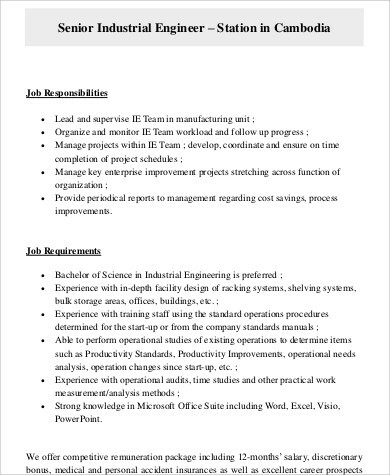 For the company information, you will be gathering some data from the type of people that you will be working with together with their roles and their responsibilities. And as for the work information, you will be gathering data from the various types of projects and workload that you will be working on. Meetings with the Senior Management – apart from gathering data from various sources, you will be also meeting your seniors or the senior management as well as the human resource department. This will include a discussion of your work schedule, company policies, compensation and benefits, payroll, and the like. Also, what you will be discussing with the senior management team will be the problems of the company along with its solutions, current scenario of the company, current and future opportunities of the company. Deliverable and Reports – of course, you will be making and submitting business reports depending on what your project is. 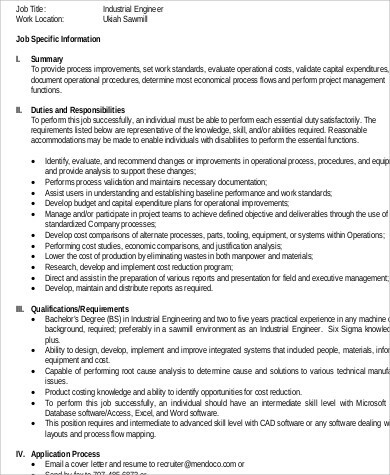 Furthermore, you may find these Civil Engineer Job Description Samples helpful and useful.